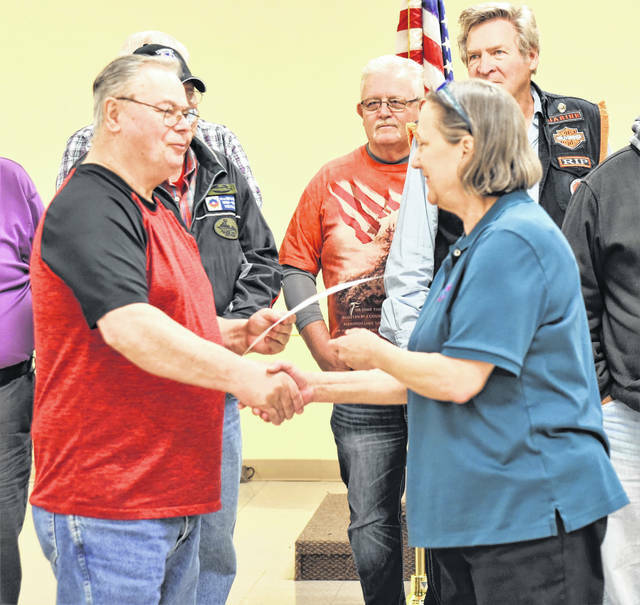 Donnie Campbell, left, of Anna, receives his certificate from Theresa Manteuffel for his service as a helicopter mechanic in Chu Lai, Vietnam, from 1968-1969 during a dinner Monday night which honored all Vietnam War veterans. 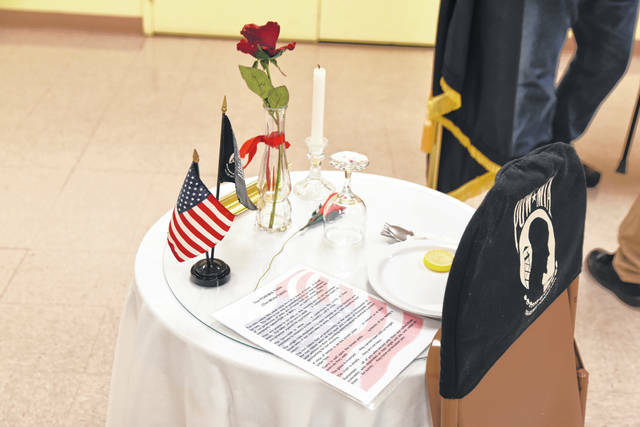 A POW/MIA table was placed part of the program to honor Vietnam War veterans Monday night. The large group of Vietnam and Vietnam Era Veterans display their Certificates of Appreciation that they received Monday night at the Sidney Veterans Service Center. SIDNEY — “Chatter” was code and the phonetic alphabet for sharing locations and orders over field radios in a different country and in a different time was a ordinary occurrence. Over 40 soldiers who benefited from that static gathered together on Monday evening at the former American Legion to fellowship with their comrades who fought in the Vietnam War. The chatter was friendly, without fear, as they shared their stories with one another about all those years ago. Chris North, Veteran’s Service director for Shelby County, welcomed the crowd with the Pledge of Allegiance followed by a prayer led by Ron Leininger, Shelby County Veteran Service commissioner. North clarified the purpose of this evening’s gathering as a tribute to the county’s Vietnam veterans and an opportunity to say thank you to the brave men and women who served. On March 28, 2017, President Donald Trump declared the Vietnam War Veterans Act of 2017, and designated every March 29 as National Vietnam War Veterans Day. In accordance with this declaration, Shelby County Commissioner Julie Ehemann officially announced that this date, from this day forward, be recognized as Shelby County Vietnam War Veterans Day. All branches of the military were represented, with the veterans proudly wearing their hats and jackets of Army, Navy, Air Force, Marines and Coast Guard and which Division they served in and dressed with what insignias they had been awarded, earned and identified by. They were connected in their experiences in that land. They were connected by the frustrations of coming home to a country which was war weary and less than celebratory for their return. Mayor Barhorst shared his experience with the display of the Traveling Wall Memorial as he met two Vietnam soldiers. “I don’t get to Washington often, but when I do, I always take time to visit the wall. When the replica wall visited Sidney almost a decade ago, I stood watch one of the nights it was here. I remember it being chilly and damp and lonely duty. It was then that I thought to myself, imagine doing this for hours at a time, day after day, week after week. Barhorst related the interruption of these soldiers’ lives mirrored in the life of another man who Shelby County was named after. Isaac Shelby had a dream for his life to be a successful farmer and grow fine cattle. He had been called to fight in three wars, serve in the House of Burgesses as well as the North Caroline House of Commons. He also held the Governorship of Kentucky and served as the first president of the Kentucky Agricultural Society. His country called and he answered. Shelby had a hero’s welcome when he had returned to Kentucky after one war he fought in. Word spread of his route and as he traveled home, people lined the road to gather a glimpse of the battle’s hero, and to thank him as he returned home to be a successful farmer and grow fine cattle. “I’m sharing this story because of Shelby County’s Bicentennial, and also because Gen. Shelby’s return home following the Battle of Thames was so different from what I am guessing most of you experienced,” said Barhorst. “As I dig through old photos, I’ve found images of Civil War veterans marching along Poplar Street, faded photographs of World War I veterans returning home and marching in parades in Sidney, and black and white photos of World War II veterans being welcomed home. Of those 850,000 veterans there are many soldiers who are in need of help but are not aware of all the services offered to them. North explained the types of programs and compensation available and gave instructions on how these vets can get that extra support they are deserved. North listed benefits from caregiver benefits to monthly monetary payments for diseases that are being added to the long list of military connected ailments and urged Vietnam Vets to come to the Shelby County Veterans Services for more information and signing up for their due compensation. A list of those diseases and a Veterans Resource Guide where handed out for home reference and an explanation of what the Vietnam Vets are eligible for. As a final thank you to the men and women attending the event, Certificates of Recognition were awarded to each person who served during the Vietnam War.